With all the movies currently out...the only one BW and I could agree upon was MegaMind and we opted for the IMAX 3D version. Go big or go home. This was a cute clever movie that we both thoroughly enjoyed. The movie begins with a distant planet's pending destruction and alien parents placing their little baby in a pod (ala Superman) to save him. As his pod streaks towards Earth, he realizes there is another baby in a pod competing with him for arrival. One pod lands in a mansion and other pod lands...in a prison. This scenario sets up the two characters on a track of good vs. evil. One baby grows up to be the hero Metro Man (voiced by Brad Pitt) and the other becomes the villain MegaMind (voiced by Will Farrell). Both the characters are faced with some pretty deep issues. Some of the subtly may be lost on pre-school age audience, but there is a lot to be discerned by school age set. At a minimum, there is an opportunity to discuss school bullying. This is not to imply that this movie is all deep and challenging. It isn't. 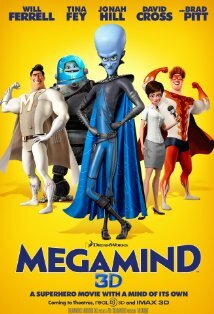 It's mostly a very funny movie and I think Will Farrell's voice for MegaMind fits perfectly, making him an appealing villain. This is a movie the whole family can enjoy. And as always, my favorite part of a 3D movie is watching the little ones who are reaching out trying to grab the images. So cute. I am looking forward to seeing this one. I hate those 3D glasses. I feel like a huge nerd. But the effects really rock! Saw the movie with M and we both loved it. Animation was cool and the 3D didn't make me nauseous this time. well, I feel like a big fuddy duddy, but I really haven't been to a movie in so long that I don't even know if they make 3-d or non 3-d versions anymore. My little one had no depth perception (which is really wierd to me but the opthamologist says 30% of the population does not have binocular depth perception. Anyway, I think the 3-D would not work. Hopefully there are regular versions. Seems everything is in 3D now! I think even that rapunzel movie is right?